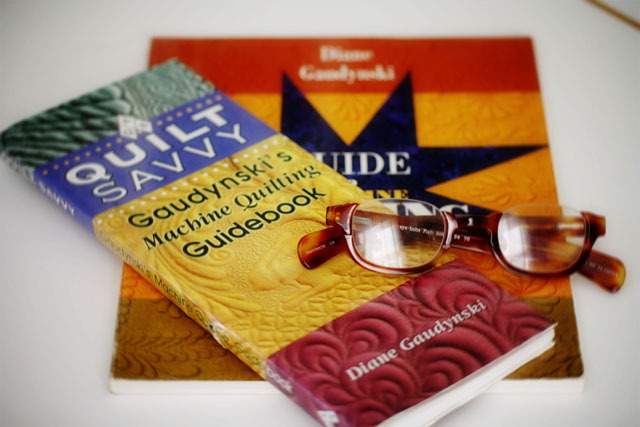 Whenever I sit down to sew, Diane Gaudynski’s books, Guide to Machine Quilting and Quilt Savvy are right by my side. Both books are filled with tips, techniques, quilt motifs as well as inspiration. You can check out her website here. Ms. Gaudynski (a lovely lady that I had the pleasure to meet while I lived in Milwaukee) is a Master Quilter and has won many, many top honors. All of her quilts are stitched on standard sewing machine–no long arm for her! In other words, there is hope for all of us! Ms. Gaudynski has written two books. I like both, but if you can only buy one, I’d recommend the smaller, spiral bound Quilt Savvy. 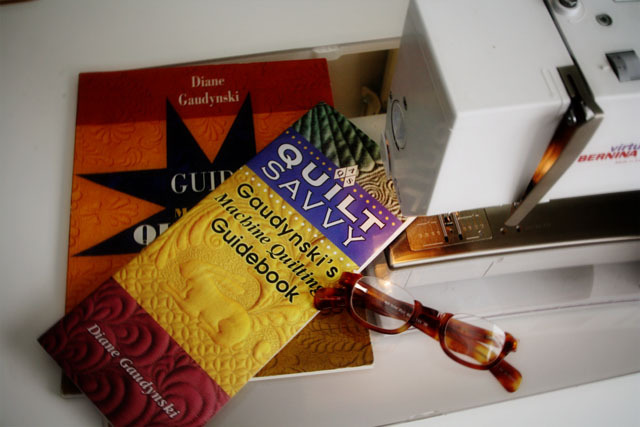 In fact, if you could only own one book on free motion quilting–I’d recommend Quilt Savvy! Do I sound like a commercial? 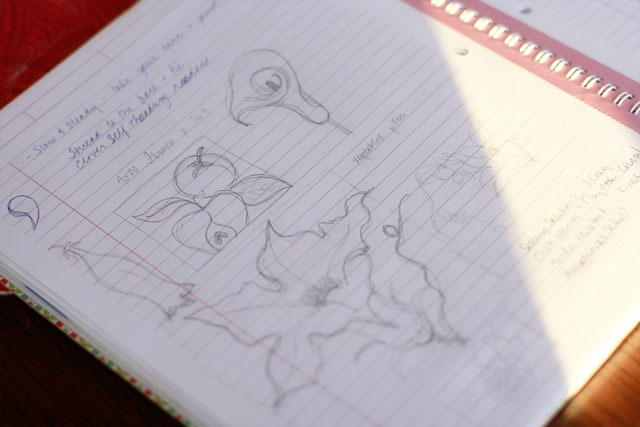 My doodle notebook...I hope you have been working on your very own Doodle Notebook..If you haven’t started one…check out the post, Doodlers are Smarter!..here. 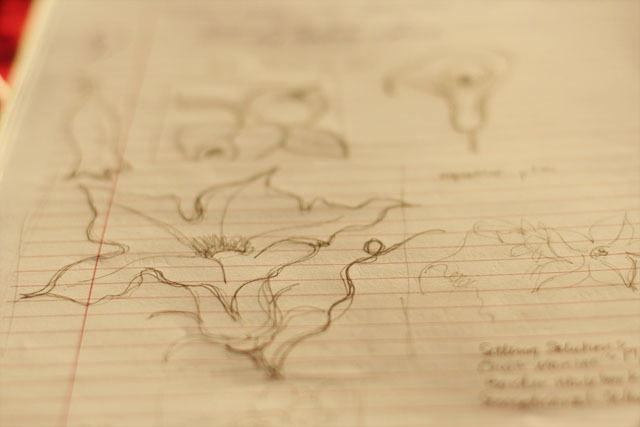 You might also like: Doodles Make the Best Quilt Designs I will be adding several more posts on keeping quilting notebooks in the near future. I think notebooks/sketchbooks are very important! And don’t forget to leave a comment in Kiss the Blarney Stone Giveaway–you might be the lucky one who wins the Shamrock Doodle Quilt! In other news…I’ve added a “Bookshelf” Tab above. I will be adding my favorites to it slowly–so check it often. I agree that Diane’s books are the best for learning/practicing machine quilting. I have taken couple of her classes and have learned so much from her. If anyone ever gets a chance to see her or take a class, or even see her work, I thoroughly recommend it. She had a wonderful exhibit a year ago in Paducah at the Quilt Museum — just wonderful!! Found your blog through Pinterest. O my, you make machinequilting look so easy..i’m learning to piece by machine, but quilting i still do by hand. I’ll browse through your blog some more, perhaps it gives me more courage haha…btw…I bought the ” big” Gaudynski book, that woman IS an artist! !